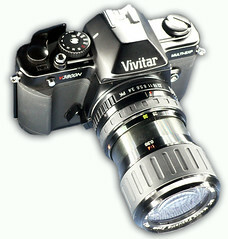 The Vivitar V3800N is a Pentax K mount manual-focus 35mm SLR marketed by Vivitar. The V3800N remained in production at least into 2012, with list price of $299 USD (w/28-70mm zoom lens) or $239 USD (w/50mm lens). Some remaining stock was available for sale new as late as 2017. The camera was manufactured by Cosina, and is a close relative to the Cosina C1s and its many name variants. However a unique feature of this model is its multiple-exposure feature: when the silver button below the shutter release is pressed, the shutter may be re-cocked without advancing the film. 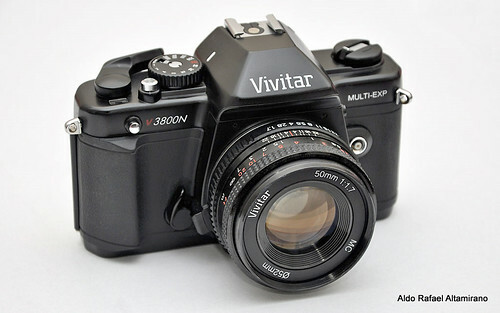 With a PC connector for off-camera flash, and a depth-of-field preview button, the V3800N is one of the more full-featured and desirable of the Vivitar V series SLRs. There appear to be two color variants of the camera body: one is all black while the other is black with a grey top housing. 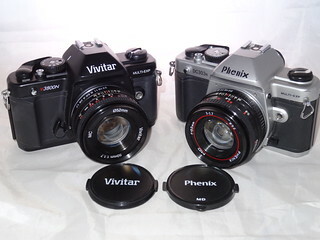 The Promaster 2500PK Super and Hikari 2002 appear to be nearly-identical cameras with slightly altered styling. The Phenix DC303N looks exactly the same. ↑ In a Facebook post the U.S. retailer Freestyle announced they had finally sold their last V3800N's in March 2017; some of these cameras had been unsold and returned stock from other "Big Box" retail chains. This page was last edited on 31 May 2018, at 14:42.